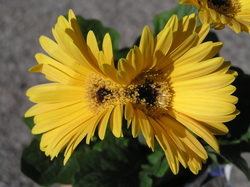 A mutant flower-duplication. But it does not result increased complexity or useful information content. Usually the redundant structures lead to decreased functionality. Mutations are unintended alterations that occur in the DNA structure and alter its information content. Some result in effects that are then transmitted to the organism's structural components. These alterations are uniformly deleterious. The concept of gene mutational load only compounds this problem and is discussed in the articles and references below. This is relevant to the creation/evolution debate in that mutations have been touted as the mechanism by which evolutionary change occurs. Mutations may result in variation, are deleterious, and they do not result in trans-organism (from one life form to another) change. Evolution has no known mechanism for increasing useful information content or for the presence of the vast variety of animal and plant groups in the earth. Article: Why the shared mutations in the Hominidae Exon X GULO Pseudogene are not evidence for a common descent. J Creation 21 (3): 113-118, 2007 by R. Truman and P Borger. Click button below to read article. "The GULO X pseudogene has been used for years as evidence for evolutionary theory. Since Hominidae are claimed to have evolved from a rat common ancestor, the modern rat GULO sequence was used as the outgroup in phylogenetic tree building. Our analysis shows that the sophisticated mathematical treatment and the conclusion that differences from the rat sequence fits perfectly with an evolutionionary model for random neutral mutations was never warranted, even had the rat sequence been representative of the intact GULO gene...."
Another Reference to the Impact of Mutations on the Genome-published 2005. Sanford, J.C. (2005) Genetic Entropy and the Mystery of the Genome,Ivan Press, N.Y.,N.Y. 2. "Is there a theoretical problem associated with continuously growing genetic load due to subtle un-selectable deleterious mutations? Yes, according to Muller, Kondrashov, Loewe, and many others. Population geneticists all seem to acknowledge the fact that a large fraction of deleterious mutations are too subtle to be effectively selected away...for higher organisms, up to 90% of all deleterious mutations should be un-selectable..."
3. "What is Dr. Ohta’s view on genetic degeneration?...She is the world’s authority on the topic of near-neutral mutations. One of my co-authors went to Japan to spend several days discussing with her a manuscript in which we used numerical simulation to clearly demonstrate that near-neutral deleterious mutations generally escape selective removal and lead to continuous and linear accumulation of genetic damage. She acknowledged that our numerical simulations appeared to be valid, and that our conclusions appeared to be valid...I think Dr. Ohta would like me to clarify that she is a faithful Darwinist and remains committed to the Primary Axiom, and that she is in fact hostile to the thesis of my book." "Suppose two mutations each reduce fitness 10%. When both mutations are present, then fitness might be reduced by 20% (additive interaction), or less than 20% (multiplicative interaction), or more than 20% (synergistic epistasis)...The only reason synergistic epistasis is even invoked in a generalized sense is when trying to argue that more genetic damage might somehow induce more effective selection (we can now clearly show that even if synergistic epistasis was normally true, it makes the degeneration problem worse)." Sandford's Response to "Beneficial Mutations"
I also insist that beneficials must be very rare compared to deleterious mutations (as do nearly all geneticists). The critical question is “how rare?” Genomes are the genetic specifications that allow life to exist. Specifications are obviously inherently SPECIFIC. This means that random changes in specifications will disrupt information with a very high degree of certainty. This has become especially clear ever since the publication of the ENCODE results, which show that very little of our genome is actually ‘junk DNA’.10 The ENCODE project also shows that most nucleotides play a role in multiple overlapping codes, making any beneficial mutations which are not deleterious at some level vanishingly rare (in preparation)...unless beneficial mutations are extremely common, they are not sufficient to compensate for accumulating deleterious mutations.... The bottom line is that selection removes only the worst deleterious mutations and amplifies only the best beneficial mutations. This means that the accumulating damage is largely invisible (like rust on a car), while adaptations tend to be highly visible (e.g., antibiotic resistance)...Where are the beneficial mutations in man? It is very well documented that there are thousands of deleterious Mendelian mutations accumulating in the human gene pool, even though there is strong selection against such mutations. Yet such easily recognized deleterious mutations are just the tip of the iceberg. The vast majority of deleterious mutations will not display any clear phenotype at all. There is a very high rate of visible birth defects, all of which appear deleterious. Again, this is just the tip of the iceberg. Why are no beneficial birth anomalies being seen?...Figure 3c in my book (based upon Kimura) shows an exponential-type distribution of deleterious mutations, with most deleterious mutations being ‘nearly-neutral’ and hence un-selectable (effectively neutral). But, as I point out, Kimura’s picture is not complete, because degeneration is all about the ratio of good to bad mutations. Kimura does not show the beneficial distribution, which is essential to the question of net gain versus net loss! 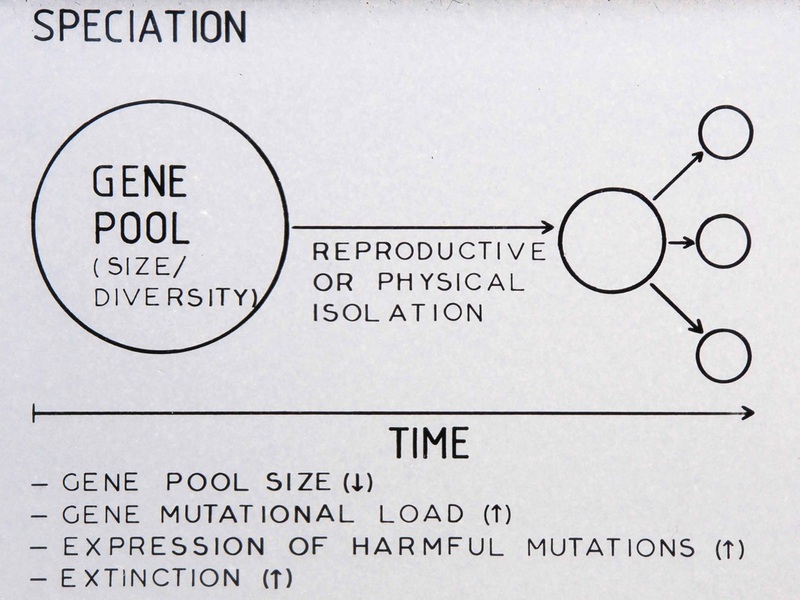 When I show the beneficial distribution (while Kimura did not do this, I suspect he would have drawn it much as I did), anyone can see the problem: the vast majority of beneficial mutations will be un-selectable..."
Note: CMI has given me permission to extensively quote Dr Sandford. Speciation does occur, but the simple diagram above reveals that it does not lead to trans-organism change. It, speciation, strongly argues for variation within a "kind" of organism only. As well, it may be a part of a process of adaptation to changing environments. But, neither concept has been shown to lead to trans-organism change. Yet, deterioration of organisms by this process has been shown to occur. For a discussion on gene mutational load see the articles above. 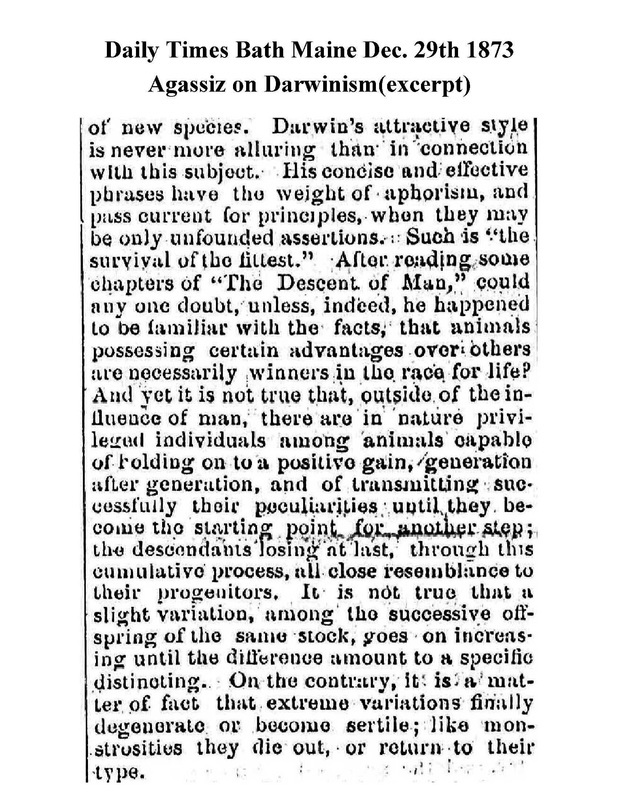 See the articles below for a more in depth discussion on the subject of speciation/adaption. Above diagram by JGL. "Mutations alter the nucleotide sequence of the DNA. They may affect the organism’s phenotype, which can play a key role in bacterial adaptation and transformation to changing environments. Some of these mutations even appear to be benefi cial to the organism. ...However, analysis showed that most contained deletion mutations in various genes. Each of these examples, as well as numerous others, involves certain environmental conditions that make these mutations phenotypically benefi cial. However, these mutations frequently eliminate or reduce pre-existing cellular systems and functions. This has been referred to as antagonistic pleiotropy; meaning the cell experiences a trade-off where a temporary benefi t for surviving one environmental condition is provided at the expense of systems used for other environments..."